In the immediate aftermath of the movie-theater scene last week, Peggy and her SSR colleagues are in shock over the 47 dead people in the movie theater. And no wonder: It’s a disturbing terrorist attack, the kind that most of these superhero movies circle around. (Perhaps exactly what superhero movies are compensating for.) Sousa finds the leftover canister, gets a whiff of it straight to the face, and tries to choke Thompson. He wakes up tied to a bed, with Peggy waiting by his side. This is about the first and only time I can see their coupling working. The SSR has realized that the canisters will likely be used on the people of New York. “Why?” asks Peggy. “Because he’s a Russian jerk with a chip on his shoulder?” says Thompson, because he seriously has no idea what people are or how they function. Who put this blustering joke in charge? I mean, seriously, come on, how is that any kind of motive? Sometimes Thompson is just ridiculously dim. Peggy counters that he probably tricked them into bringing him over Russia, and he’s targeting something specific. Howard Stark appears on cue, with Jarvis in tow, and says he’s pretty sure he’s the target. They have a nice expositional conversation that ties up several disparate points. I do really enjoy this show, but I haaaaaate how it delivers information. The gas is called Midnight Oil; Howard made it to keep soldiers awake for days, but it gave them psychosis and hallucinations and was stolen from Howard’s lab to be used by the American military (a fact that is too quickly passed over?!) in the Battle of Finow on the Russians. The gas was known to cause asphyxiation, which is why two of the Leviathanians had no voice boxes. They also find out that Ivchenko is really Johann Fennhoff (a.k.a. Doctor Faustus, according to the Marvel Wiki), with a specialization in hypnosis. Howard suggests they use him as bait in a public show that will draw Dottie and Fennhoff out. I’m not sure how making yourself bait for potential life-threatening hypnosis is a good idea, but it does luckily change Ivchenko’s mind when he hears Howard’s doing a press conference over the radio. This happens all while Dottie attacks and kills a man for his plane in the background, so it’s no wonder that when Ivchenko tells her things have changed, Dottie whines, “Just since I left the car?” Oh, I will miss Dottie, especially the high-pitched honeyed “talking to a foolish man” voice she uses on everyone from the cop to Howard to the dentist. As Jarvis holds up a mirror, Howard trims his nose hairs, which Jarvis says looks like “a nest full of spiders with very short legs.” This episode — heck, this show — really did not have enough Jarvis. Howard balks at Peggy’s armor and goes to the lab to get his own. Peggy confronts him about how he’s punishing himself by doing this, but he explains that he took what she said last time to heart, about how he needs to fix this. BUT HE STILL STEALS BACK STEVE’S BLOOD. What the hell, Stark? Howard is his usual smarmy self at the press conference — he basically out-smarms the smarmy Thompson, but with more charm. (I’m so sorry. It’s true, though!) He’s still captured after Dottie shoots the guards of the getaway car and sets up a sniper rifle. Howard attempts to buy the guy — the hypnotized cop that pulled Dottie over in the beginning of the episode — off with money, cars, and Rosalind Russell’s phone number. Meanwhile, Peggy and Thompson realize that Dottie and Ivchenko are planning to drop the gas canisters in Manhattan for VE Day. I suppose that makes sense since it’s only been a year since the war ended, but it could’ve been presented in a more interesting way, like the face Jarvis makes when Thompson says the dastardly duo can’t go airborne because they took all of Howard’s planes. Jarvis explains that Howard has a whole other plane vault (I mean, who doesn’t? ), and we flash back to Dottie standing in it six months earlier, with Howard explaining to her exactly how it all works. He’s still flirting with her in the present and trying to remember her name until Ivchenko/Fennhoff reveals his very personal reasons for wanting Howard to suffer: He saw his brother’s mangled, broken body in Finow, as a result of Howard’s gas. Fennhoff tells him to go back to a moment of his greatest shame and asks him, “What would you do differently?” We end up back in the Arctic, because Howard’s greatest shame is not finding Cap. When the SSR agents get there too late to grab Howard from going in the air, they send Jarvis after him to take him down. Peggy goes after Dottie and Fennhoff in the air-traffic room, and Peggy and Dottie finally face off. Dottie is all flips and kicks, while Peggy is more knees and elbows; at one point Peggy effectively uses a blanket against Dottie’s knife. Dottie gives a revealing speech where she tells Peggy she’s jealous of girls like Peggy: “I wanted to walk like you! To talk like you!” I wish we’d learned a bit more of what she meant. Is it Peggy’s authenticity, or just free will? In any case, Peggy kicks Dottie out a window. Meanwhile, Thompson and Sousa defeat Fennhoff through the use of earplugs (to fend off his hypnosis — um, why didn’t everyone bring a pair?). We started the episode with the radio show from way back in episode two — I forgot how much I missed it — but we actually go way, way back to the beginning: when Peggy first lost Cap. The faux-Peggy confesses her love for Cap as his plane is about to crash in the Arctic, foreshadowing Peggy’s penultimate scene in the show, talking down Howard from dropping a bomb over Manhattan. In a way, the show has always been leading up to this moment. Setting a part of the Marvel Cinematic Universe in the 1940s means certain characters parallel others. Howard Stark’s willingness to sacrifice himself is what Tony Stark learns in the first Avengers movie. Peggy’s story parallels Cap: She’s mourning him just as much as he will mourn for her in the future. She taps into that mourning to talk Howard down, but she’s basically talking herself down from her loneliness when she tells Howard, “You are the one person on Earth who believes in me.” Howard wakes up, follows Jarvis home, and everything’s fine, except Dottie escaped. The whole SSR office applauds for Peggy when she comes in the next day, but of course, a congressman comes in and makes a beeline for thanking Thompson, which he, jerkface that he is, accepts wholeheartedly! Sousa gets up in a tizzy, but Peggy brushes it off. “I know my value,” she explains. “Anyone’s else opinion really doesn’t matter.” Words to live by, Peggy. Words to live by. Sousa also asks her out to drinks, but she has to meet a friend. They exchange looks as if they have chemistry. Still, nope. And of course, other people’s opinions matter if it means they give you a whole apartment, like Howard does. She decides to share it with Angie! I wonder what code words they’ll use when they have people over. Jarvis gives Peggy Steve’s blood, which he swiped from Howard. She pours it in the East River, whispering, “Bye, my darling,” to the tune of “The Way You Look Tonight.” Okay, that broke my brittle heart a bit. But also, couldn’t she have done that sooner? 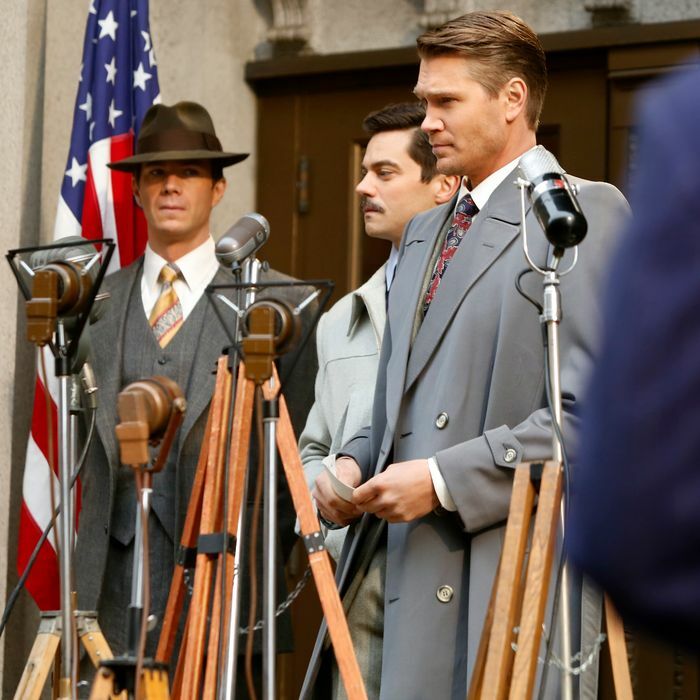 It’s up in the air if Agent Carter will have a second season, so perhaps we’ll meet again? Let’s hope so.